The following Retouch tools on your Nikon D5600 camera tweak exposure and color: D-Lighting, Quick Retouch, Filter Effects, and Monochrome. Although these tools might not make you choose one camera over another, if you already have a Nikon D5600, they are available, so you might as well learn how to use them! D-Lighting: Active D-Lighting brightens too-dark shadows in a way that leaves highlight details intact. You can apply a similar adjustment to an existing photo by choosing D-Lighting from the Retouch menu. You then see before-and-after views of the image. 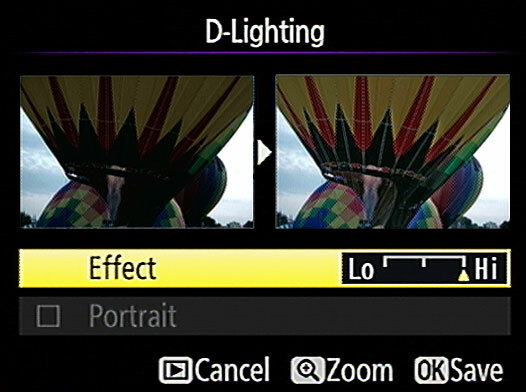 Press the Multi Selector left or right to adjust the Effect option, which sets the strength of the adjustment. With the D-Lighting tool, you may be able to brighten areas that are too dark without blowing out highlights. Also note the Portrait option, which is underneath the Effect option and dimmed in the figure. If the camera recognizes faces in the photo, you can select this option to limit the exposure adjustment to areas around the face (or faces). However, only three faces (maximum) are considered for this special exposure change. Also, you must have captured the photo with the Auto Image Rotation option on the Playback menu enabled. You can’t apply D-Lighting to a picture taken using the Monochrome Picture Control. Nor does D-Lighting work on images that you created by applying the Quick Retouch filter, covered next, or the Monochrome filter, detailed later in this list. Quick Retouch: This tool increases contrast and color saturation and, if your subject is backlit, also applies a D-Lighting adjustment to restore some shadow detail that otherwise might be lost. As with D-Lighting, you can choose from three levels of Quick Retouch correction. And the same restrictions apply: You can’t apply the filter to monochrome images or to pictures that you created by applying the D-Lighting tool. Filter Effects: Choose this option to access two warming filters, which enhance warm (red and yellow) tones and reduce the intensity of blues. Select Skylight for a subtle warming effect; select Warm for a more noticeable change. Monochrome: When you choose this tool, you can opt to create a black-and-white copy of a color original or to create a sepia or cyanotype (blue and white) image. You can’t apply certain Retouch menu options to an image that you create using the Monochrome tool: D-Lighting, Quick Retouch, and Soft filters are among those that don’t work. Obviously, filters related to color adjustment also are no longer available. So use those filters before heading to the Monochrome option.